Roger has bought Mel lots of presents, which she passes onto Des and Matt. Her and Roger kiss. In her excitement, Mel struggles to remember Des and Matt's names so they introduce themselves. Rosemary tells Tracey that she has some friends that she thinks they should take to dinner. Tracey doesn't want to go though, she knows they are Rosemary's friends. Tracey reminds Rosemary about boarding school and Rosemary agrees to talk later about it. Tracey thinks she should go back to her old school – it's what they both want. Des has come to visit Harold. 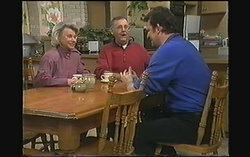 He greets Harold and Helen and tells them he's getting married. Harold and Helen both offer their congratulations. There is one thing he wants to tell them though, which concerns Harold, he'll be moving to Perth and needs to sell his share of the Coffee Shop. Harold has first offer but obviously, if he doesn't want it he'll need to put it up for sale. Des says he'll be selling for $30,000. Harold looks thoughtful whilst Des and Helen talk more about the wedding. Josh has a go at playing the didgeridoo but is about as successful as Todd was. He jokes that it needs a mouthpiece. Melissa and Cody don't know why they're worrying about it – because they don't want a didgeridoo for their song! Beverly is interested in hearing these songs as she's heard so much about them. The boys say they're not quite ready and the girls don't want to play it in case the boys laugh. Eventually, the girls agree to sing it. Beverly thinks it's terrific, whilst Josh and Todd agree that it was meaningful. Helen and Jim talk about how great it is that Des has found someone, they also comment on the fact that they'll be getting new neighbours. Rosemary comes to help in the kitchen to talk to Helen. She tells Helen she's booked the flight to New York but she can't get through to Tracey. Helen asks what the alternative is. Rosemary says Tracey wants to go back to boarding school but Rosemary would prefer she stayed with Helen. Helen tells her that if Tracey was a business deal she'd find a way, all she's done is dump Tracey on everyone else and then wonders why her and Tracey don't communicate. Helen tells her Tracey is Rosemary's problem. Paul thinks the reason Caroline is upset with him this morning is because of the way he's handled her relationship with Jim. He apologises. Caroline tells Paul that her relationship with Jim is over. When Paul asks what happened she says the opinions from the sidelines didn't help but Beverly is pregnant and Jim wants to save his marriage. Paul looks shocked. Madge asks how Harold went with the bank manager. Harold isn't impressed with the monthly repayments. Madge is glad they can have the money, even if they have to tighten their belts a little. Harold thinks there's an easier way though, if he can show a greater profit then he'll have more of a chance of getting the money – he's going to raise the prices. Melissa and Cody want to hear the boys song. Josh and Todd say that it's not totally finished yet but they play it anyway. It's very interesting…to say the least! The lyrics seem to be “computer brain” and focused on depressing things about the world. The girls don't think it's great – too pessimistic. Harold's putting up the prices and Paul and Caroline catch him in the act. Harold tells them that Des is planning on selling and Harold needs to up his profits – has he raised them too much? Paul thinks they look quite reasonable, especially as everything is going up these days. Beverly walks past and Caroline asks to speak with her. Caroline tells Beverly that things between her and Jim were never serious. Beverly responds that she's sorry their problems involved her and she's sorry if she's been hurt. Caroline tells her that Jim always loved Beverly, she knew that. Beverly thanks her. 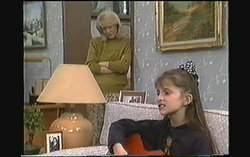 Tracey is strumming on the guitar and Helen asks her to play something. Tracey says there's a song her mum liked, and Helen asks her to play that one. Tracey isn't sure she can remember the words but Helen tells her to try. Tracey begins to play and sing. She remembers the first line (“the warmth of your smile…”) but can't remember the middle only the end goes “but simply you're my friend”. Tracey says she used to know it off by heart and goes to play something else. Jim and Paul are talking about Caroline. Jim wants to know how she's been at work and Paul says she's bouncing back, she's very resilient. Jim tells Paul that although he knows Paul wasn't keen on their relationship, he's always been very fond of her. Mel walks in and introduces Roger to Paul, Jim and Madge. Paul and Jim go and Roger and Mel sit down at a table. They begin to talk about the cruise – Roger wants to be honest with her. The cruise was fantastic but they have to be realistic now. Roger says he's much older, he's been divorced and has too children. Mel says it doesn't matter, she loves him. Roger says he's come to some serious decisions about their future and they need to talk about it. Helen comes through from listening to Tracey on her guitar and asks Rosemary if she's spoken to Tracey about her plans for next week. Rosemary says she's genuinely tried and doesn't know what to do next. Helen says she can't bare the thought of Tracey being abandoned. Rosemary gets upset saying that they all can't be perfect like Helen in these situations and that she's making her feel very guilty. Helen comes to comfort her and say she knows she's done her best. There's a silence between them and we can hear Tracey singing the song from earlier. Rosemary recognises the song and says that her and Sonia used to sing it a lot when they were kids, the song became quite special to them. Josh goes up to talk to Harold – the bill for their drinks is too much. Harold explains that the prices have gone up. Des comes over and asks Todd when he's going to pick up the drums but Todd says he has taken up a different instrument – the didgeridoo. Des thinks he's joking and when he realises he's not he offers to throw in some free lessons. Todd accepts his offer. Mel asks Paul is she can leave work early, she doesn't look very happy. Paul asks if everything is OK, and Mel says it is and then leaves. Caroline and Paul think that Roger has dumped her. Rosemary is at the table in the kitchen and Tracey is singing in the lounge. Rosemary looks quite sad and gets up and watches Tracey from the doorway whilst she sings. She eventually joins her on the sofa and sings the next chorus to Tracey who listens carefully to the lyrics and joins in at the end. But simply, you're my friend. Des, Matt and Caroline are talking. Caroline thinks that after today, she wouldn't be surprised to hear that Roger dumped Mel. Matt doesn't think that holiday romances last anyway, and Des agrees saying that he is much older than her too. The three of them agree that Mel is going to be devastated. Just then she walks through the door. She's very happy and Roger follows her. Caroline asks if everything is OK. Mel says she had to wait until her and Roger had been shopping, but, they're engaged! They all congratulate her.